I have been in an extremely baking mood this afternoon. I don't know if it had something to do with the gloomy weather outside or my severe sweet cravings, but nonetheless I decided to bake some funfeti, Halloween addition, I know it's a bit late, cupcakes. I also started on making some of my famous home made croissants. I would share the recipe with you all, but it's a secret. The one thing that you do need to have if you want to make croissants from scratch at home, is patience. It takes about a day to prepare before you can actually put them in the oven to bake. But let me tell you, it is worth every second of labor, because they just melt in your mouth! All this baking got me thinking about wedding cakes. How do you decide if you are going to have one, how big it is going to be. Do people really even eat the wedding cake at the wedding? These are just a few of the questions that were bouncing around in my head this afternoon. So I thought I would share with you a little advice that I have learned throughout my wedding planning. One, not many people actually eat the wedding cake passed at the wedding, so save a few bucks and get a smaller cake and have a dessert station. If you want your cake to look big and extravagant, fake a few of the tiers with cardboard. It is really simple and the bakery will have no problem doing it for you. Not only will this save you money, but it will also save you the hassle of having to deal with 100 pieces of cake left over. The next step is probably the most fun part of the cake process, and that is choosing the flavor, or flavors if you'd like. I personally love the idea of having each tier be a different flavor, as long as they sort-of mesh together. You probably don't want pineapple and carrot in the same cake. Last is the style. Traditional, modern, square, round. The options are truly endless these days so it really does take a lot of thinking about to decide on what you want your cake to look like. After you have come up with a definite theme or color scheme for your wedding then you can get a better idea of what cake would look best at your venue and with all of the decor that you have chosen for your special day. I love this for a spring time, garden wedding! 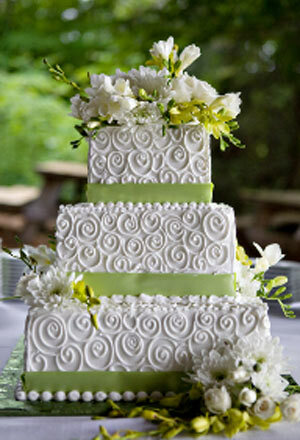 A more traditional cake, simple and elegant, I love!! And then ladies, there is the grooms cake to think about too. But that is definitely a more fun cake to choose. I suggest picking something that your groom loves as the theme for this cake, like his favorite sports team or a favorite hobby of his. I think I will be getting Morgan a Gators themed grooms cake, seeing as we are avid Gator fans and both soon to be alumni! Well, I am finally all finished with school work for the night, so I am going to go pop in a movie with my roommates and relax for the rest of the night! Until tomorrow!